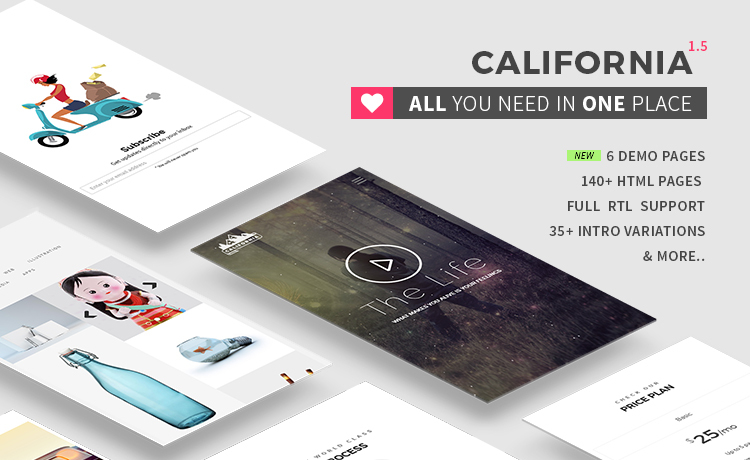 California is a high quality multipurpose HTML5 template. Designed with Bootstrap 3. Build a great website with this truly multipurpose html template. If you are looking for one of the best Multipurpose HTML Template for your fantastic website, you have come to the right place. 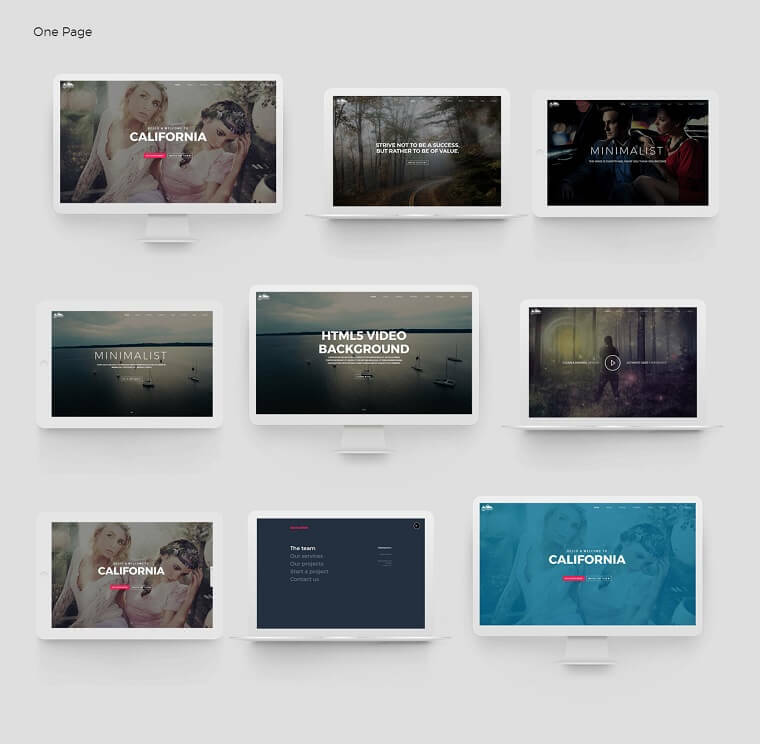 ThemeWagon is releasing California, A High-Quality Multipurpose HTML5 Template to satisfy your purpose. You can build a unique and attractive website for your agency, corporation, personal blog, portfolio, photography, e-Commerce business, shop, creative works, product-branding, startup initiative or whatever website you want with California! California is truly an elegant template designed with HTML5, CSS3, Bootstrap 3, SASS & jQuery. 1000+ hours of research by some geeks & nerds ensures a great UX & eye-catching design (well, they may be nerds and geeks, but they are the best in their fields and know what it needs to make a great template). All these cool features made it one of the best High-Quality Multipurpose HTML5 Template. California has 130+ HTML pages, 30+ readymade intro styles, one page & multipage layout variations, shop page, RTL support, 12 built-in color schemes, integrated mailchimp, working contact form & some other extraordinary features. You can watch what’s inside in this best multipurpose bootstrap template California. It will take less than 3 minutes. What else can you expect from an HTML Template? Download California – the High Quality Multipurpose HTML5 Template powered by Bootstrap framework and create an amazing website to boost up your business. California was developed with mobile first design concept. The template was first designed to run smoothly on yor handheld devices and was later scaled up for Desktops, laptops and other screen sizes which makes it a 100% responsive multipurpose template. Bootstrap 3 made it easy to design this high quality multipurpose HTML5 template responsive. You can test it from your mobile phones, tablets, iPads and other handheld devices along with desktops and laptops. Nobody uses a non-responsive website nowadays. Google will penalize your site if you use a mobile unfriendly website. Obviously, it is a crucial ranking factor. As a web development agency with more than seven years of experience, we went through various Google algorithm updates. We know this very well. So when we designed California, we built it responsive. It’s 100% responsive multipurpose HTML template and one of the best of it’s kind. Search engine optimization (SEO) is the heart and soul of a website. It indicates how well you will rank in google search or bing search or yahoo search. We made this awesome multipurpose HTML template SEO optimized. All you need to do is to change the meta title and meta keywords. Add your meta description, meta tags and meta keywords on your website. Built an SEO friendly website with California – the search engine friendly high-quality multipurpose HTML5 template. At ThemeWagon – we thrive for quality. Our support team is working relentlessly to resolve the issues and to ensure the optimal quality of the product. Our support managers will go beyond your expectation. Recently we are providing support regarding premium templates users only. We want to make sure that your issues are taken care off early, so we are not supporting the free responsive HTML5 Bootstrap templates anymore. Buy California – the high-quality multipurpose HTML template and get great support developing your website. We are continuously developing free responsive bootstrap powered HTML5 templates and premium multipurpose HTML templates. We want you to help us grow. So please help us by sharing our website with your friends. All the templates are beyond awesome. I cannot thank you enough for making my job much easier and I don't have to work so hard. Thank you again. California covered all the design aspects. From header to footer, everything's awesome. Can't wait for it WP version. It got almost all the things I needed. Thank you for your awesome creation. Keep it up. I have been looking for a polished, professional, and creative template to update my site. With the recommendation of one of my friends I bought this template and my satisfaction is pretty high. Wishing best for the great team. With a lot of features California is worth your money. One of the best. This template is awesome, everything is just in place and perfect. This is an excellent template with quality features. Got support with quick response. Simplistic, minimalist UI. Liked the typography. Will there be a Word Press version? If so, when? How is the blog handled? Is there a content management system or is it just html pages? Hi John, thanks for your interest. Yes, we have a plan for the WordPress conversion but it’s not gonna happen soon. And, there’s no CMS in the template even on the blog. I bought the template, and I am wanting to switch out the map for just a regular jpeg. I am having trouble with this, can someone walk me through this? If i buy this theme, should i have to pay for it monthly? or for one time? Hello, I have a little problem. When I play the video of the portfolio frame (the one that has a bottle as a photo) the video doesn’t start. The emerging window stays black. Thank you for the support! Why a landing page http://hellojewel.net/theme_preview/california/special_shop.хтмл when you click on the product throws to the page, it’s a landing page? Hey I just bought this template, I love it!! I noticed it includes Linear Icons Premium version but on their official site (https://linearicons.com/premium/preview) it offers a wider selection of icons than the ones that are available with the template. Is there anyway I can get those newer ones onto it? The version we have added that was that version so You may not find the new icons as those are premium. What about bootstrap modals? It’s work but show under overlay and menu. Any suggestions? this template support Cyrillic fonts? Hi, I recently purchased your California design and like what I see. Can you share with me how to make the full page background images responsive for all devices? The idea about fullscreen background is when you load the site in different browser size then The background image will resize automatically and take the available space. As We have too many devices so The process is automatic and the image will show a portion in smaller devices. Of-course you can use media query to load different images in different media screen size. You may open a support ticket if you need any technical help. Thank you for your response. Yes I understand responsive design, however the background images in a number of the theme home page websites are NOT resizing as they should. Hello @kevinkreitz:disqus would you please open a support ticket or just email me the urls where background images does not work properly so I can fix those and update the template. Hi I just bought your CaliFornia theme. It looks promising, good job 🙂 By going through there was still something I was missing (perhaps overlooked). Everything seems to be like fullscreen. I would love to have also for the homepage, the possibility to have like 3-4 cm on both sides free, perhaps even on top, so a smaller container, including header, and the possibility to have a like plain background color all behind. Of course in the mobile version that should disappear as it would take to much space. Just a suggestion for what I would love to have added. And a question: Is your theme woocommerce compatible, as it has shop pages? Hello @disqus_OLaelBuawH:disqus, I think we already talked in support ticket. The template is in html so woocommerce is not supported yet. We are planning to release the WordPress version, We will let you know once we upload premium version. Hi. Planning to purchase the template. I will be using it for blogging site, which is published on github using jekyll. Please let me know, if the template which will be available for download will have option for the jekyll version? Hi. Bought the theme and there seems to be a problem using the back/forward buttons of the browser. The page content stays blank without loading…only the footer is loading. (using Safari 9.0.1). Please look into this since it’s rather critical. Thanks for letting us know about the safari bug. We already fixed the bug in the current release. Thanks – this seems to do the trick! Great. Please let us know your feedback about the template, We are add more features based on our user feedback. Thanks! Loving the theme so far. One very nice design feature would be a template for a “Service Detail” page; so that it would be possible to go from the “Services” overview page to a “Service detail” page. This would of course be a very general design template, but a product/service detail page with service/product details, text, some parallax effects etc. would be nice (e.g. inspiration from http://www.apple.com/iphone-6s/technology/ for inspiration). Having a page like that would really make the California Template stand out from the competition! Noted Sire, I will make sure this kind page will be added in the next version.